Friends, it has been far too long since we have sent out a newsletter. We are grateful for your continued support and hope that you this newsletter gives you a sense of what we have accomplished with your help! The work in Uganda has been continuing and the progress the team has made in 2017 is amazing! New programs have been created and are impacting the two communities that we work in as well as the surrounding areas. As I haven't been on the ground since March I wanted to share a more comprehensive update from Dr. Isaac and the team at Tusubira Village. Warm regards to you. As we come to the end of 2017, I am pleased to share with you a summary of activities that we have been able to carry on in 2017 at Tusubira village. Before anything, on my own behalf and on behalf of the team on this side, I wish to register our ever-warm gratitude for your extraordinary commitment and dedication, which has enabled us, have a successful year of impacting communities. Empowering people through education and inspiration our mission statement has been at the forefront in all our day to day planning and activity implementation. We rely on our mission statement to build towers of hope in the hearts of the hopeless and light a candle of “possibility” in lives of the desiring men and women. • We have been able to set up and maintain the demo gardens from where people come to learn and get inspired. Some people come on self-invitation, others are invited. • Provided school fees and scholastic materials to 10 primary children and three students in secondary school levels. 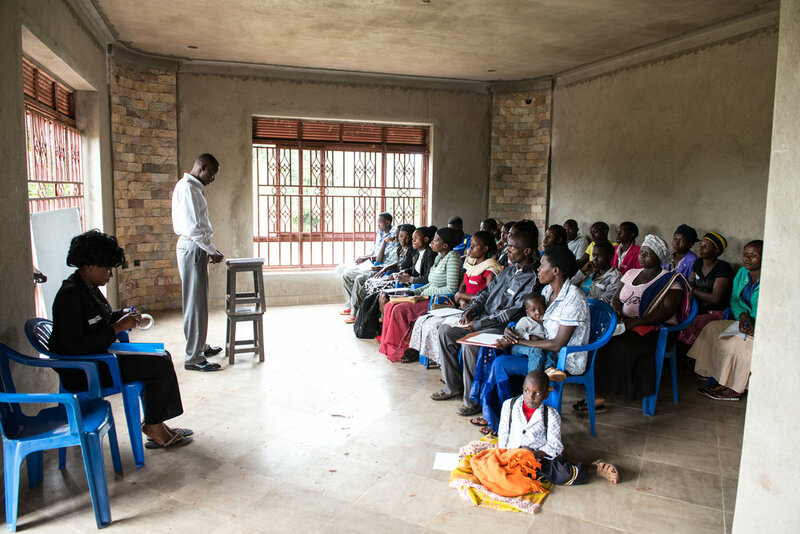 • Using the monthly donations, we have been able to accelerate progress on the education building. Much work has been finished; the major remaining work is fitting glasses, painting, soak pit, window insect screens, kitchen fitting, and water tank. • Built 6 African grass thatched houses with a total of 13 rooms for accommodating volunteers and guests purposely to generate income for sustainability. • Planted more trees and demarcated the compound. The compound is now fully maintained and we employed Musoke the husband to Beatrice to work on the compound on monthly pay. • Attended schools parents meetings for schools where our beneficiary children attend. 2017 was an amazing year at Tusubira Village and in the communities we work in. I know that 2018 will be even better! I want you to know that we couldn't do the work that we do without the support of our incredible donors. We are grateful for our monthly donors that allow us to continue to grow our programs and impact these communities in sustainable ways. We are grateful for our donors who give to fundraisers or that think of us throughout the year. And if you are looking for a place to make an end-of-year donation, we would be incredibly grateful if you would consider The Grow Hope Foundation. The button below will allow you to either make a one-time donation or sign up as a monthly donor.